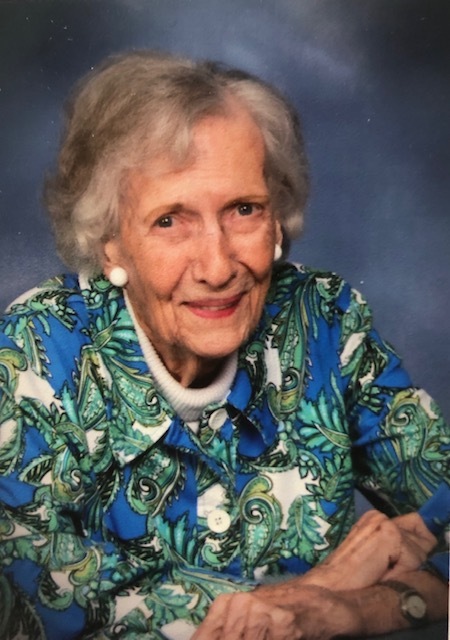 Sara Dunning Nichols of The Blake at Township, Ridgeland, Mississippi, died on March 22, 2019. Sara was born on February 18, 1920, the daughter of Samuel Thomas and Addie Ferguson Dunning. Sara lived in Canton most of her life and graduated from Canton High School. She attended Mississippi State College for Women and Draughns Business School in Jackson. She worked for the Mississippi State Library Commission and also as a deputy chancery clerk of Madison County. On November 1, 1942, Sara married her childhood sweetheart, Thomas Vernon Nichols, Jr. of Canton. Sara was a lifelong member of First United Methodist Church of Canton, and served her church in many ways. She was a recipient of the “Cheek Memorial Award” in recognition of her service. She and her husband, Vernon, sang in the choir for over 50 years. Not only was Sara once the assistant organist, but she also played the piano in her Sunday school class up until last month. Over a 15-year period, Sara knitted 1,100 children’s sweaters for African humanitarian relief. Mrs. Nichols was preceded in death by her husband after 58 years of marriage. Survivors include her son Bruce Nichols (Brenda) of Fredericksburg, Texas, her daughter Carol Nichols Sneed (Dr. Bill) of Jackson, and her daughter Ann Nichols of Jackson, as well as her grandson Dr. Travis Nichols (Katy) of Boerne, Texas, and her granddaughter Katherine Sneed Worley (Hunter) of Birmingham, Alabama and four great grandchildren, Tyler, Mason, and Abby Kay Nichols, of Boerne, Texas, and Sara Ashton Worley of Birmingham, Alabama. Visitation will be held on Monday, March 25, 5:00 – 7:00 pm and Tuesday, March 26, 10:00 am at Breeland Funeral Home in Canton, MS.
A memorial service will be held at 11:00 on Tuesday, March 26 at First United Methodist Church, Canton, MS. There will be a private interment. Memorials may be made to the First United Methodist Church, Canton, or to a charity of choice.